spent solitary periods while out at night either pursuing his fantasies, window peeping or brooding about perceived inequities in his life. Michael advised Sutton Associates, during a set of interviews, that he was in the habit of regularly leaving his home at night to widow-peep at the nearby residence of an older woman. He would go specifically to watch this particular woman in various states of undress. Further, Michael stated that on the night of Martha's murder, he snuck out of his house and went to this woman's residence to watch her. After leaving the outside of her residence, he went to the window of Martha Moxley's room and made an effort to contact Martha by calling out her name. After his efforts proved unsuccessful, Michael states he masturbated in a tree outside her window before returning home. This information leads us to consider another crucial offender characteristic cited in the Academy report. This particular detail was included in the Post-Offense Behavior section: This section will enumerate for the reader the behavioral changes the analysts believe would be manifested by the person responsible for the murder of Martha E. Moxley. 1. It is believed that after leaving the victim's body, the offender returned to the scene of the crime before her body was discovered. After departing the crime scene, he went home and thought about what had happened. Finding it hard to believe that he had murdered his friend, he returned to verify that she was in fact dead. As you will also later read in this report, Michael recalls passing by the spot, that night, where Martha was ultimately found, and sensing someone's presence. He, in effect, visited the scene of her murder shortly after she was killed. Needless to say, we believe none of these crucial details were originally shared with the police. Only years later did Michael come forth on these points. In terms of motive, we have found considerable evidence to show he had been involved in a romantic relationship with Martha Moxley. According to one source, Michael and Tommy even fought over her on occasion. Along the blurred lines of teenage liaisons, Michael was known to be Martha's boyfriend for some time. As of this writing, we know substantially less than we would like about this relationship, and, in particular, what it meant to Michael. This is an important blank spot which needs to be filled. 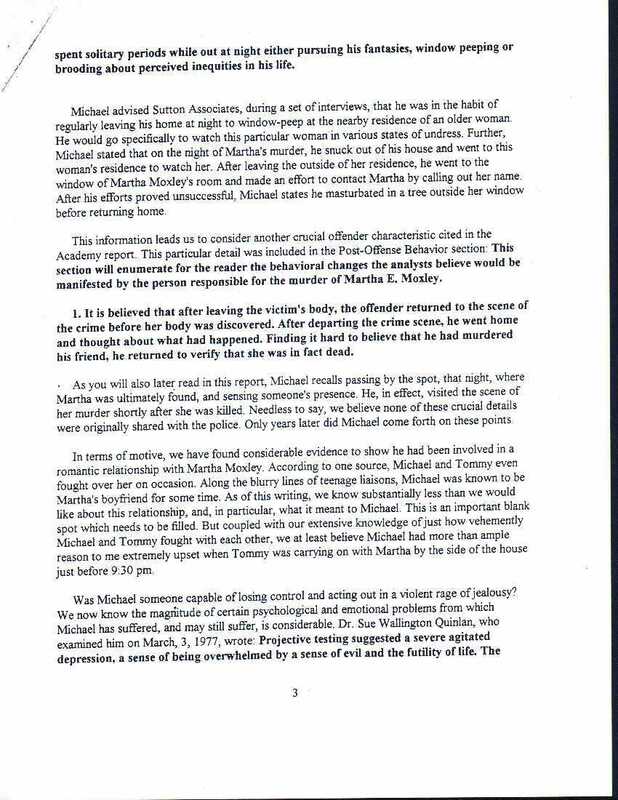 But coupled with our extensive knowledge of just how vehemently Michael and Tommy fought with each other, we at least believe Michael had more than ample reason to me [WW] extremely upset when Tommy was carrying on with Martha by the side of the house just before 9:30 pm.